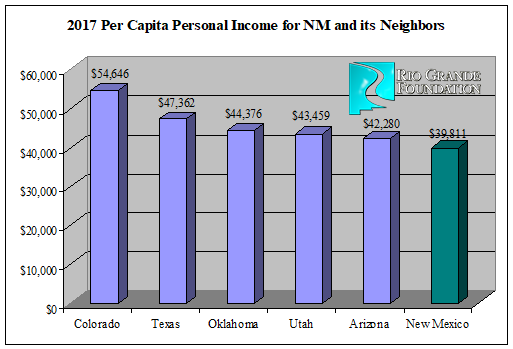 According to data from the Federal Reserve Bank of Saint Louis, New Mexico’s per-capita personal incomes are the lowest in the Southwest region and 3rd-lowest in the nation (beating out only Mississippi and West Virginia). In fact, the AVERAGE New Mexican earns 37% less than the average Coloradoan, an astonishing difference between neighboring states. While some will say, but…Colorado is a “blue state too…” the reality is that Colorado is among the most economically-free states in the nation. New Mexico is in the bottom quarter. And, based on the deluge of bad legislation coming out of Santa Fe, it is likely that both New Mexico’s economy and its economic freedom standing will suffer in the years ahead. 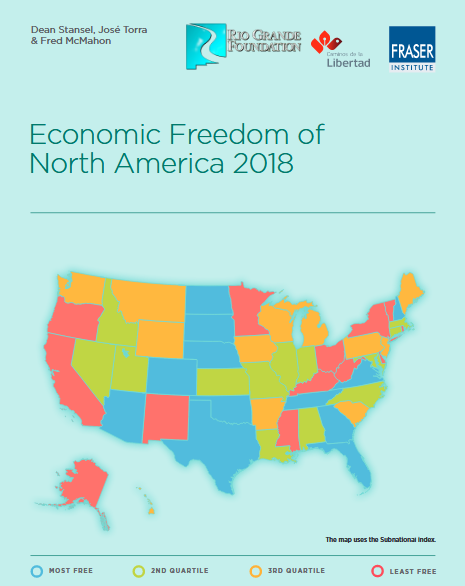 For more on economic freedom in North America, take a look at the map below which shows which states are the freest and least free, but also check the full report of the Fraser Institute and a detailed explanation of economic freedom. This past election only proves what I’ve known for many years. New Mexico voters as a group don’t really look at the candidates running for office. They did not look closely at Grishams programs and how she wanted to pay for them. The typical Democratic line “Raise taxes and spend more than it brings in”‘ kill the oil and gas industry that supplies millions if not billions of dollars to the economy; her stance on firearm ownership is a direct result of the Denocratic party line. So here we are again at the bottom of most lists.